The Betfred free bet is a huge offer, exclusive to all new customers. 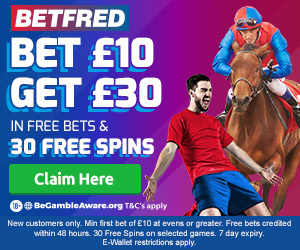 Sign up with Betfred today and they’ll give you £30 in free bets plus a bonus of 30 free spins on selected games in their casino! This is a yabadabado-deal! This is a generous new customer promotion. As far as free bets go, you don’t get much better than £30 in free bets AND 30 free spins in Betfred’s casino! Free bets + free spins = bonus! It’s pretty darn simple to get this free bet. Just sign up by hitting the Best Free Bet Scout’s exclusive free bet button below and you’re on your way! Betfred will then top up your account with £30 free bets and 30 free spins within 48 hours of your bet being settled! Betfred is a UK-based sports bookmaker founded in Salford, in the late 60s by two brothers: Fred and Peter Done, under the original name ‘Done Bookmakers’. Betfred.com was launched in 2004, and these years of experience really shows. They really understand their punters which is reflected in their super simple, super clean website. Nothing gets in the way of you placing your bet and enjoying the game. When browsing the latest premier league odds for example, you’ll notice they flag up which matches are on TV in the UK. Betfred.com is pretty simple to use. It has a very traditional interface with conventional UI elements which make navigation around the site straight forward. The bet slip always sits collapsed in the side panel so it’s really quick and easy to access. The ‘In play’ area has really neat drop down menus for all the live sports in action, which gives you instant access to placing a bet during a match. Betfred uses a simple, yet professional palette of colours which provides a really clean visual appearance. It uses accent colour cues throughout the design to highlight the users own controls such as the bet slip and registration buttons. Overall it’s an attractive design which will appeal to the masses, using traditional ‘sport’ brand colours inline with the well-known sport broadcasters. Betfred has a dedicated mobile URL, betfred.mobi which is tailored specifically for mobile use. It’s bold design brings all the most important features to your finger tips. It’s super quick and responsive which make betting on the go really straight forward. Betfred has dedicated hotlines for both UK calls and calls from abroad. You can also get in touch by email, or even better, by live chat. Their live chat is gives you clear information about your position in the queue if you have to wait. Best Free Bet Scout has never had to wait long to chat with a knowledgable expert for help. Overall their customer service team is knowledgable and efficient at getting to the bottom of your issue. Best Free Bet Scout is really impressed with the features and promotions Betfred has to offer. There are so many ways to get more enjoyment out of betting at Betfred. #PickYourPunt: Customised odds just for you! Double Delight and Hat-trick Heaven: Bet on a first goalscorer and Betfred will double the odds if they score a brace, and treble the odds if they score a hat-trick! Double Design and Hat-trick Heaven in-play: Bet on the next goal scorer and get double the odds if they score two, and treble the odds for the hat-trick! 20% bonus on footie outrights: Bet a Lucky 15 or Yankee on outrights from the top 5 football leagues and if the four win you’ll get a 20% cash bonus!